Circa 1916. Escape to a historic seaside retreat in Melbourne Beach, Florida just 200 feet from the Atlantic Ocean at one of the iLoveInns.com Top 10 Romantic Inn of 2009. Feel refreshed in the comfortable yet elegant ambiance of four island-style buildings surrounded by lush tropical landscaping with winding brick walkways. Relax in the spa pool. Generous amenities include a concierge, complimentary soft drinks, snacks and a daily newspaper. Distinctive and inviting guest rooms and suites in the main house, north and south cabanas and the carriage house feature fresh flowers, robes, bottled water and evening turndown service with sweets. 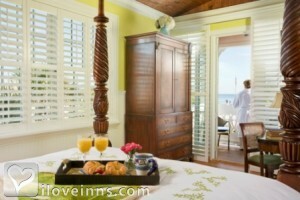 Breakfast is served on the large private porches or in the dining room. Payment Types Accepted Include Visa, Discover, American Express and Master Card. This property has 11 total guest accommodations, 10 with private bath, 10 with hot tubs, 1 suite and 9 cottages. The types of beds available include King, Twin and Queen. We are proud to be named the #3 Top Small Hotel in the US for 2017 by TripAdvisor! Soak in the bubbling spa pool. Romance packages are offered along with luxurious linens, robes and towels all nestled in a quaint complex with winding brick paths and bamboo fencing. Lush tropical landscaping, garden courtyard, fountains and Spa pool. 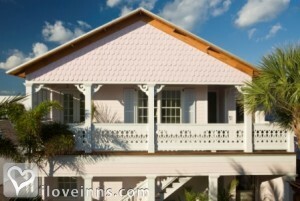 The Pink House at 201 Ocean Avenue was built around 1916. A weathered plaque found in the house states that the land was originally sold in 1922. Around 1925, the house was bought by Walter Brown. A short time later, the family purchased the cypress house across the street from the casino that they named Port d'Hiver or, Winterport. Our unique version of French Toast is truly heavenly, replacing bread with flaky croissants. We have stayed here several times, brought friends with us the last time. Everything is perfect, everytime, without exception! We still talk about the cookies! The place is so clean, it is like brand new. Be sure to bring a bathing suit anytime of year to enjoy the heated pool/spa-awesome! My husband chose the lovely Port d'Hiver as the location for our night's stay after he proposed to me. It was truly a perfect experience. The room was fantastic! It was impeccably clean and good smelling. The whirlpool bath was a delightful surprise! We didn't really venture out into the pool area, but as we passed, I took notice of how clean and beautiful the area was. The next morning, breakfast was served on our balcony. We still talk about how delicious it was! We're planning on having another stay in the near future! It an amazing experience. The rooms were immaculate! We stayed in the Windward Suite. The staff is absolutely wonderful. They helped us make VIP reservations at a local restaurant and had dessert send out at the end of our meal. Chilled and brought up our wine at night. Each morning, breakfast was delivered onto our private porch (which tasted amazing by the way). Can not ask for more. Absolutely the best!! Only drawback is you have to walk across the street to get to the beach, but considering everything else it's hardly a bother. Definitely will be coming back year after year! Port d'Hiver provided the perfect romantic getaway for this Colorado couple. After spending a couple of wonderful days with family in Satellite Beach, my parents presented us with a gift of one night at Port d'Hiver. What a treat. 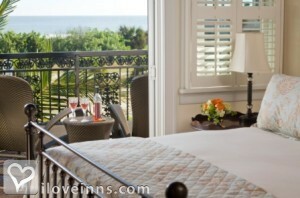 The ocean views were only surpassed by the ocean spray rolling into our room as we awoke. The grounds of Port d'Hiver are beautiful and the rooms stunning. We spent the day on the beach, and the evening by the pool enjoying Port d'Hiver's private label wine with brie en croute. Breakfast was delivered to our private terrace, where we basked in the morning sun, watching the waves roll in. We've stayed at many B&B's throughout the country and this is our favorite. We look forward to returning in 2009, hopefully to stay a bit longer. Be sure to reserve a couple of courtesy bikes. It's only a short ride to Melbourne Beach for a slice of NY style Bizarro's pizza. Perfect place for people watching! This is a lovely Inn. It is quiet, has beach views and is beautifully restored. The hospitality makes it a most enjoyable place to stay. We recently spent the weekend at Port d'Hiver Bed and Breakfast with my brother and sister-inlaw. We had two oceanfront rooms with a full balcony. It was absolutely a romantic and wonderful weekend. The rooms are beautiful, the baths are fabulous. The Innkeepers are very attentive, every need we had was meet, my brother is diabetic and has to refrigerate his medication. They provided a in room refrigerator for him. The bedding at Port D'hiver is truly spectaculor. When your head hits the pillow at night the only thing keeping you from falling asleep immediately is the homemade treat that is left on your pillow when they turn down your bed! There is a coffee/tea bar that is available 24/7 with fresh homemade cookies, and a refrigerator stocked with soda, and water along with an assortment of snacks. We started every morning with a sunrise stroll down the ocean for a few miles. We had to get ready for the decadent breakfast that is served every morning. We live in Melbourne just 10 miles away from Port D'hiver, but once we walk in the door, you can just feel the serenity and peacefulness wash over you. We love our weekend getaways at Port D'iver, it is great location for a romantic getaway, honeymoon, anniversary, or a special celebration. Everthing you need for a great weekend is right there or close by. 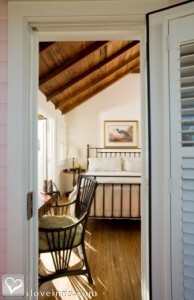 The lovely view from Ella Belle's Room, the ocean breezes and warm sun, the sumptuous linens, the delicious breakfasts--we could go on and on. To state it briefly, Port d'Hiver is the perfect place to spend a romantic weekend...or longer! Thank you Linda & Mike for our delightful stay at your beautiful bed & breakfast! We have been to Port d'Hiver twice in the past year, once in summer, once in winter. Both times the rooms swept us off our feet. The ocean views are one thing, but the full moon's reflection casting down onto the dark water was breathtaking. The staff did everything possible to make our stay romantic, bringing breakfast to our suite or offering outside tables when we came down. Really an excellent B&B. We stayed 3 nights the week of Thanksgiving and were treated like royalty. 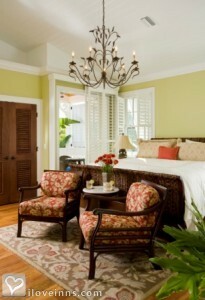 The rooms/furnishings are first-rate, the host beyond accomodating, and the beds so comfortable. Add in a romantic, couples-oriented environment, and this outstanding property is truely deserving of Select Registry status. Port d'Hiver took the number 1 spot for B&B's the first few minutes after entering the room. 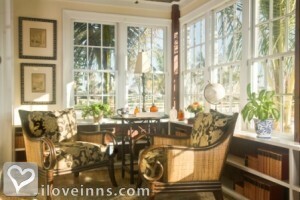 The inn keepers are great people with a desire to make your stay the best possible. Breakfast was great and the conversation even better. Attention to detail is evident in this B&B. It was 40 degrees outside and the heated pool was great. It takes a lot to impress me but this place did the job. I look forward to returning soon! This was a tremendous B&B with excellent service and an incredible facilities. Our room was the perfect place to get away and relax for the weekend. Clean, quaint and elegant. Stayed here for 1 night in November and would certainly;y return. Breakfast was exceptional! 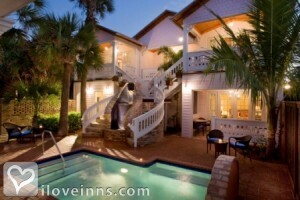 We were so pleased to have chosen Port d-Hiver Bed and Breakfast for the first night of our honeymoon. We were greeted so warmly and loved the Sunset room with the view of the ocean. We chose a private area of the porch for our breakfast and enjoyed a gourmet breakfast. I would recommend the B&B to anyone who has a birthday, honeymoon, anniversary or any other special event to celebrate. We loved this place.Port d'Hiver is by far our favorite b and b-and we have stayed exclusively in b and b's. 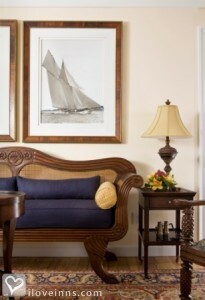 The rooms, and I toured them all, are a combination of Ralph Lauren/Tommy Bahama feel. Each room is outfitted right down to the mirrors on the walls in the right places! The attention to detail by the owners and staff was impeckable and the food was the best we have ever had in a b and b. We suggested they write a cookbook for their guests with the history of their dishes that they served us. We were there for the shuttle launch and stayed at Port d'Hiver for 6 days and even though Port"Hiver was 40 miles away from our festivities, the drive was easier than it sounds for it was a straight shot down the coast highway with lots of sightseeing and such. The location was perfect for all that we wanted to do in the area. Again, this place was fabulous-cozy, private, and personal yet complete! Can't wait to go back. My husband and I stayed at Port D'Hiver over the New Year 08/09 and were nothing but impressed. I requested the romance package for our arrival because it was my husbands birthday and was totally blown away. The door to our room was opened and we were greeted with soft music, candle light, rose petals and a bottle of champagne chilling in ice. The room looked just magical and my husband was lost for words. We stayed for 3 nights and wished we could have stayed longer. There were lots of little touches which made our stay more comfortable such as the 24 hour snacks and soft drinks, 5pm refreshments in the main dining room where we had a chat and met with other guests and 24 hour coffee and fresh baked cookies. There were DVD's we could watch in our room and board games available and a spa pool to have a dip in. When we went to our room at night there was always a piece of freshly baked cake waiting for us and the breakfast was the best we have ever had and kept us going all day. There isn't a bad thing to say and the whole team were nothing but cheery and helpful and nothing was too much trouble. They are an amazing team who have got the combination right when it comes to customer service and personal touches. Can't wait to go back and we will be one day. I stayed at this B&B in September and had an amazing time. Out room was gorgeous and the service was excellent. We got a full tour when we arrived. We loved the snacks and fridge by the pool. Very convenient. Also we had brought a beach umbrella and it broke but the B&B had plenty of fun beach stuff for us to use: chairs, umbrellas, etc. 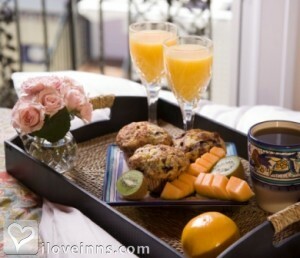 The breakfast was delicious and I give Port d'Hiver 5 of 5 hearts! I was so impressed with this bed and breakfast. The room was immaculate, clean, and the bed was so soft that I didn't want to leave. The heated pool and jacuzzi bubbles were very relaxing. The staff was more than friendly, giving us suggestions on where to go to find the atmosphere we were looking for. The inn has a great location- right across from the beach, close to shops, restuarants, and entertainment but still quite if you're looking to just stay in. I would absolutely stay here again. I have stayed here twice in the past year and my only regret was that I didn't make enough time to stay there a third. Perfectly situated near the beach and enough restaurants to satisfy any appetite. Great service and beautiful rooms and surroundings. I've recommended it to everyone I know. Have been wanting to vist Port D'Hiver ever since I stumbled across it on the web and finally the opportunity arrived that we could go. We spent 2 nights in celebration of my boyfriends birthday and had an excellent all around experience. We frequent the Melbourne Beach area quite often and can say that we definitely will be returning. 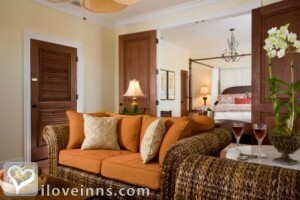 The entire property is beautiful and everything about all the rooms looks brand new. The bed is likely the most comfortable bed I've ever slept in. Also I should mention that we found the staff to be extremely accommodating and the breakfasts, happy hour appetizers and bedtime treats were all very delectable.